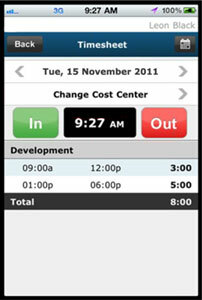 RALEIGH, NC – June 2012 – Acroprint Time Recorder Company is pleased to announce the availability of mobile apps for the popular AcroTime online time clock. Mobile apps are available for both the iPhone and Android platforms, and allow employees and managers to easily access AcroTime features from their smart phones. Employees can use the mobile app to clock in and out, change their cost center/job code, submit time off requests, view their timesheet and more. Managers can quickly and conveniently accomplish most common tasks, including reviewing and approving employee timesheets and time off requests, viewing employee profiles, and accessing a convenient employee in/out board to see at a glance who’s working and who’s not.